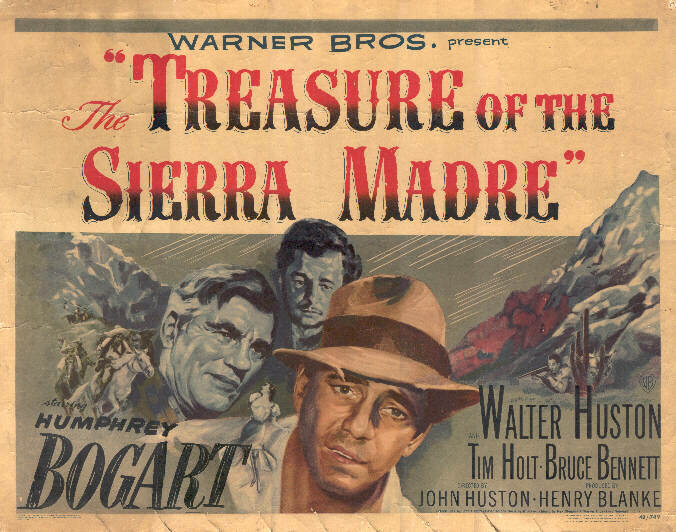 Two down-on-their-luck men, Dobbs (Bogart) and Curtin (Holt) and a prospector, Howard (Walter Huston) , join forces to search for gold in the mountainous wilderness of the Sierra Madre, Mexico. Under the threat of bandits, strangers and the harsh environment, their store of gold increases, while their own greed and paranoia threatens to overcome their dreams of freedom. The Treasure of the Sierra Madre is the third pairing of the legendary Humphrey Bogart and director John Huston. Filmed in 1948, the movie won Academy Awards for Best Director, Best Screenplay and Best Supporting Actor. The film was also included in the National Film Registry in 1990, due to its cultural, historical or aesthetical significance. Bogart shines here as the jaded, penniless protagonist who gambles his life on striking it lucky. But the treasure of Treasure is the radical deconstruction of wealth. The seasoned prospector Howard observes that gold is only valuable because of the labor others put into finding it and then it’s only good for making teeth and jewellery, echoing the Marxist notion of the labor theory of value. Does gold (or any material) have any inherent value? Gold is useful for other things today – it has many useful properties, but even then it’s value is determined in relation to other factors (i.e. humans). On the other hand, Howard also comments that wealth itself is not a bad thing – the problem is with the person who gets it. The desperate Dobbs though believes he can control his desire for more and more gold, but as the pile of gold heaps higher, so does his paranoia. Dobbs is convinced that his companions are planning to kill him to take his share of the gold and cracks begin to form in his mind. Dobbs is not alone in his broken world however. When Curtin heads to the village for food supplies, Cody an American who might want to cut in on their treasure, follows him back to the campsite. The trio decide to kill him. Before they can do the deed, banditos stumble across their campsite and Cody is killed in the ensuing gunfight. Finding a letter from Cody’s wife, there is a sense that they are somehow complicit in creating a widow even though they didn’t actually kill him. Clearly, their struggle for the easy life has brought them a long way from anything resembling home. Jesus is cautioning his followers here to choose their treasure carefully, because thereafter the heart, the affections (and subsequent actions) will follow. Of course, if Jesus is who he says he is, then life here is not the end and what we do with our wealth actually matters. Treasure covers similar territory to There Will Be Blood, A Simple Plan and No Country for Old Men. And incidentally, Paul Thomas Anderson studied Treasure extensively while working on There Will be Blood. But where No Country ends in futility, and A Simple Plan ends in resignation, Treasure ends with hope – hope which begins with the realisation that our material treasures and our lives are ultimately fleeting.